Twin Cities Luxury Auto is proud to present two of our finest vehicles in inventory at the 2013 Twin Cities Auto Show at the Minneapolis Convention Center. Gracing Luxury Lane is a 2013 Maserati GranTurismo Sport finished in Rosso Trio and a 2013 Bentley Continental GT V8 in Dragon Red – an absolute stunner. 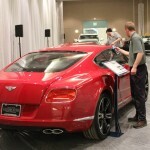 The exhilaration of driving a Bentley to the Convention Center, and further driving the new Continental GT V8, a vehicle that can cost over 200k, is just something not many people get to experience. While the drive was nice, and the process of getting into Luxury Lane a little stressful, overall I think that for possible future clients the only thing they’ll experience is pure joy. The GT V8 is a great option for those potential buyers who want the best new thing to come from the Crewe factory, and want to see how a V8 performs in Coupe as opposed to the much larger Mulsanne. With the addition of the V8 engine comes better fuel and engine management systems as well as the new release color in Dragon Red. 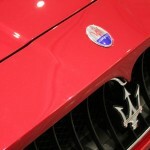 As for the Maserati, this GranTurismo will turn heads and keep people talking long after you’ve passed them by. With a Ferrari-assembled engine, the GranTurismo Sport just doesn’t sound like anything else on the road, save for a Ferrari. The engineers and designers in Italy have prided themselves on creating one of the most exhilarating and best looking and sounding cars in history. While its looks may suggest otherwise, this elegant refined Maserati has a mean side and when switched over to Manual Sport mode break neck acceleration is right at your fingertips. 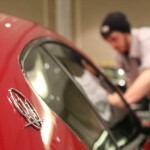 The 2013 Twin Cities Auto Show is open from March 9th to March 17th and features over $15 million in new vehicles. Cadillac, Hyundai, Kia, Lincoln, Ford and Nissan all have a presence plus many more brands across the spectrum. Come to Twin Cities Luxury Auto or any of Morrie’s dealerships and ask for a discounted ticket for the 2013 Twin Cities Auto Show. 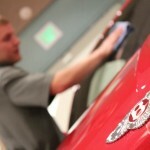 Also be sure to check out Luxury Lane and see the 2013 Bentley Continental GT V8 and the 2013 Maserati GranTurismo Sport. We’ll be looking for you! Print article This entry was posted by Alex Bellus on March 15, 2013 at 2:29 pm, and is filed under Car Shows, Events, Exclusive Events. Follow any responses to this post through RSS 2.0. You can leave a response or trackback from your own site.